Filling your bean bag does not have to take hours, here we discuss the easiest way to fill your new bean bag cover with a minimum amount of fuss and mess. Filling a beanbag can be fun, and it doesn’t have to be time-consuming if you follow these simple steps. Always have two people to fill a bean bag, as filling on your own is quite difficult. Make sure you do this indoors in an area that is free from any wind or breeze. Turn off any fans or air-conditioners that will create air movement, as the lightweight beads will blow everywhere with the slightest breeze. Keep children, pets and babies locked out of the room you are using, as the lightweight beads can cause suffocation if ingested by a child or pet. Make sure when you purchase a bean bag cover that you buy one with an inner liner. An inner liner not only makes filling easier; it allows you to change covers as required. Inner liners make cleaning the outer cover easier, as you can remove the inner bag once filled and place the outer cover in a washing machine or tub, provided the material is washable. Make sure the area where you are going to fill your product is clean. Use a floor surface that is covered with tiles, linoleum, or timber so if you do spill any of the beans; it is easy to clean up the mess. Use a vacuum cleaner to clean the floor first, so it is free from dirt, dust or lint. A funnel can be made from a plastic waste paper bin or a plastic bucket. The type that you buy from a reject shop or a ‘two dollar’ shop will usually suffice. Use a Stanley knife, box cutting knife or hacksaw blade to remove the smaller end of the bin or bucket. Removing the closed end will create a funnel, so you can pour the bean bag filling easily. Using a paper clip or corn cob holder, undo the safety zipper on the inner liner bag. Insert the funnel into the hole and tighten the zipper around the funnel. Bean Bag filling may usually be purchased in 100-litre bags at major department stores such as K-Mart, Big W and Target. While one person is holding the funnel, the other person can cut open the bag of filling. Don’t cut across the corner at 45 degrees. Instead, cut along the end of the bag, about 150mm, or half the width of the bag. Discard the piece of the plastic bag that you have cut off. Now, gradually pour the contents into the funnel. You will be able to gauge how quickly to pour, ensure that it is all going in the bag and not on the floor! Do not overfill your bean bag. Overfilling makes the bean bag less comfortable and places undue stress on the stitching and zipper. Remember, this little bean bag may be holding over 100 kilograms of weight when an adult sits on it, and that places enormous pressure on the seams. As a rule of thumb, try to fill the bean bag to around two-thirds of its capacity. It is easier to add filling than it is to remove it. Once you have filled the inner bag with the required amount of filling, remove the funnel and do up the zipper. 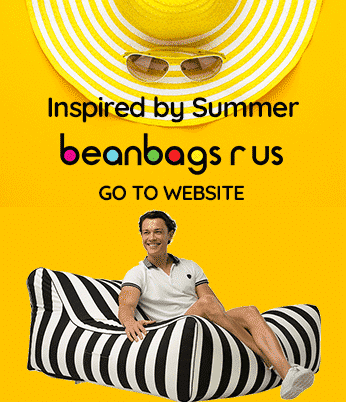 Now you can place the filled inner bag into the bean bag cover. To clean up any spilled beans, use a vacuum cleaner. A bag-less vacuum cleaner like a Dyson will allow you to re-use any beans that were spilled on the floor. Make sure you get all loose beans up from your floor surface as they can be dangerous to humans and pets if swallowed. Filling your new bean bag does not have to be time-consuming or messy. If you follow these easy steps, it will take just a few minutes, and there should be little or no mess. Please dispose of the plastic bags that your products and filling came in thoughtfully. We suggest placing them all in one bag and putting them in your recycle bin. Remember these bags can be dangerous if children get their hands on them, so dispose of them immediately after use. Buying bean bag covers and filling them yourself will save you a tremendous amount of money, as pre-filled bean bags are considerably more expensive to freight than covers only.